Buy a golf gift online. Golf Delights Gift Box. Golf Tee's , Cooler Cup, Markers and so much more. This Golf Gift Box is a perfect gift for the person in your life that just loves the course. You may choose the medium or large ensemble. Medium Box: Golfers Fortune Cookies, Golf Cooler Cup, Funny Golf Ball Markers, I Love Golf Note Pad, Golf Theme bag w/ Honey sweet peanuts, Creamy Vegetable Spread, 3 oz. Summer Sausage, Bite Size Chocolate Chip Cookies, 5 oz. 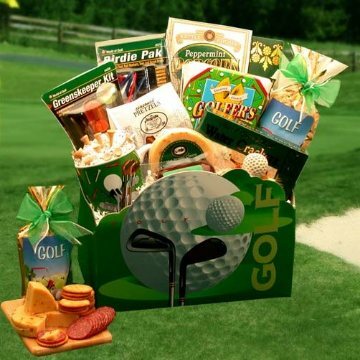 Tomato Basil pretzels, 1.5 oz White Cheddar popcorn, 5 oz Buttercrunch Caramel corn, in a Large Golf Theme Gift box. Large Box: Golfers Fortune Cookies, Golf Ball Magnet, Golf Cooler Cup, Funny Golf Ball Markers, I Love Golf Note Pad, Greens Tees Ice Cream Pint of Tees, Golf Theme bag w/ Honey sweet peanuts, Hot pepper Cheese, Stone Wheat Crackers 3 oz. Summer Sausage, Bite Size Chocolate Chip Cookies, The Works Pepper and poppy Crackers, 5 oz. Tomato Basil pretzels, 1.5 oz White Cheddar popcorn, in a Large Golf Theme Gift box.